Tools and firearms are the trademark/service mark or registered trademark of their respective manufacturers. All tools were purchased from Brownells unless otherwise indicated. I read an article in the June, 2016 issue of American Rifleman on Ruger’s .45 Colt/.45 ACP Redhawk. I am a big fan of interchangeable caliber guns because this adds flexibility to the firearm, and they’re just plain fun to shoot. I fitted .45 ACP cylinders to my two old-model .45 Colt Ruger Vaqueros (refer to my article Fitting a .45 ACP Conversion Cylinder), and I have two Ruger Super Single Six Convertible revolvers that shoot .22 short/long/long rifle out of one cylinder, and .22 WMR out of a second cylinder. I wanted the flexibility of being able to shoot two different calibers with the Redhawk, but I didn’t want to pay the $800 - $1,000 for a new one. And besides, being an amateur gunsmith I knew I could convert a standard .45 Colt Redhawk to also shoot .45 ACP. I found a used older-model KRH-45-4 Redhawk on Gunbroker for a very reasonable price. The total plus shipping and transfer cost through my FFL dealer came to $660, and the seller took a credit card without any additional fees; a savings of $19.00! The best price I could find for a new model 5032 convertible Redhawk was in the neighborhood of $990 including shipping and transfer fees. 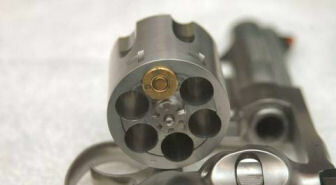 .45 Colt (or .45 Long Colt or .45 LC) cartridges headspace on the rim. On the Redhawk the rim sets on the rear face of the cylinder and ejector star. .45 ACP cartridges headspace on the case mouth. 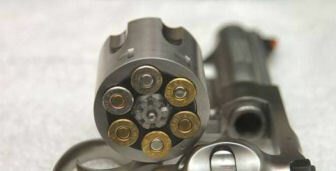 Since there is no lip in the .45 LC chamber for the mouth of a .45 ACP cartridge, that cartridge would fall through. The way to get around this is to use a full moon clip to hold the .45 ACP cartridges. .45 ACP cartridges snap into the full moon clip at the ejector groove. With the moon clip in place .45 ACP cartridges headspace on the rim just like a .45 LC cartridge. 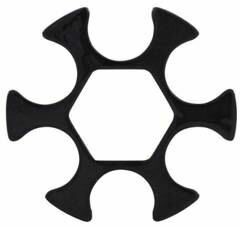 I purchased a package of 8 full moon clips from MidwayUSA product #323361. To get the moon clip to work with the .45 LC Redhawk I needed to remove metal from the ejector star. This is standard practice for competition shooters who want to modify their revolver to take full moon clips because this makes loading and unloading much faster. There is an excellent video on You Tube by TK Custom on how they mill a Smith & Wesson 686 cylinder and ejector star to accommodate full moon clips. The ejector star on the Redhawk was wide enough to accommodate the full moon clips so I didn’t have to remove any metal from the cylinder itself. To work on my new Redhawk I needed some additional parts. I purchased everything from MidwayUSA.com unless otherwise noted. Wolff Hammer Spring Pack Ruger Redhawk Reduced Power #139298 – This spring pack contains three reduced power hammer/trigger return springs; 12#, 13#, and 14#. The factory spring is 17#. Installing a reduced power spring will reduce the double-action and single-action trigger pull. On the Redhawk, the mainspring serves as both the hammer spring and trigger return spring. This is the reason why the single-action trigger pull is so heavy. HIVIZ Front Sight Ruger Redhawk 4" Barrel with Pinned Front Sight Steel Fiber Optic #211617 – The front sight on this older model is pinned in place and I prefer green instead of red. 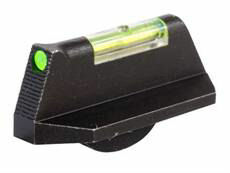 HIVIZ makes replacement front sights for both the older and new Redhawk models, all are available from MidwayUSA. There are many books and You Tube videos on how to disassemble the Redhawk. This gun did not come with the manual, but a quick call to Ruger customer service and the nice lady there sent me one. Disassembly instructions are included in the manual. I placed all small parts in plastic trays so they wouldn’t get lost. There are five different plungers and springs used in the revolver and they are all different, so I was careful not to get them confused. When I reassembled the gun I made sure all moving parts were properly lubricated. Ok so this used gun didn’t come with the special tool for removing the monogrip. During my call to Ruger customer service I asked for the tool and they sent me the tool and instructions free of charge, but I found a video on You Tube showing how to remove the monogrip without the special tools. Insert two plastic cards between the bottom rear of the grip and the frame. Do this on both sides of the frame. I used some old NRA membership cards. Slip a screwdriver blade between the two cards to spread the monogrip away from the grip panel locator. I used Popsicle sticks. The plastic cards help to prevent marring the frame. Slip the bottom of the grip forward, remove the plastic cards and separator (screwdriver blades or Popsicle sticks), then slide the grip down off of the frame. After disassembling the Redhawk I performed a full inspection. This gun was used and not cleaned very well. If I was a professional gunsmith I would charge $40 every time someone brought me a dirty gun! I gave it a thorough cleaning but did not lubricate anything until after I inspected and modified parts. 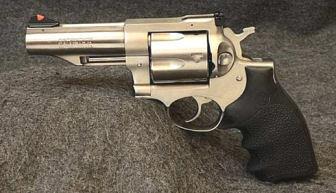 Every big-bore Ruger single-action revolver I have ever owned had the same two well-known problems; the chamber throats in the cylinder were undersize, and there was a constriction in the barrel where it screwed into the frame. This is extremely detrimental to accuracy since the bullet is being swaged to a diameter less than the bore diameter. I have written a complete article on how to accurize these Ruger big-bore single-action revolvers (refer to my article Accurizing the Ruger Single-Action Revolver) by opening up the chamber throats and removing the barrel constriction. I needed to see if this Redhawk had the same issues as its single-action brethren. I measured the chamber throats in the Redhawk and they all measured 0.451”. I oiled the bore and drove a soft lead slug from muzzle to forcing cone and found there was no constriction inside the barrel. The Ruger web site showed that my Redhawk was built in 2008. As late as 2011 it was reported that many Redhawks suffered from light primer strikes. Internet research indicated this was caused by a short firing pin, thick hammer surface, a short and/or radiused transfer bar, or a combination of any or all three. However, not every model or individual revolver displayed this problem. 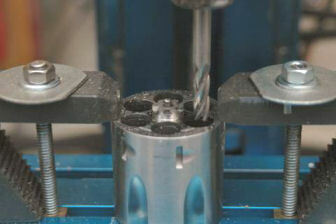 The most common fix was to remove a small amount of metal, 0.0005 – 0.001 from the top face of the hammer so it would move the transfer bar farther against the firing pin. I pressed the trigger and lowered the hammer so it would press against the transfer bar and firing pin. I measured the firing pin protrusion with my homemade firing pin protrusion gauge and it measured 0.050”. With the hammer removed I pressed the trigger and pressed the transfer bar against the firing pin. 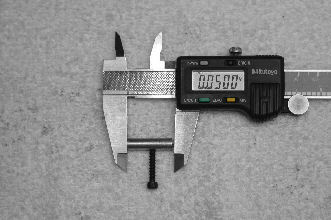 I again measured firing pin protrusion and it also measured 0.050”; industry standard is 0.050” – 0.055”. Because protrusion was the same with and without the hammer I didn’t have to remove metal from the top of the hammer face. Dry-firing the gun showed me some areas that required some light stoning. There was a burr on each side of the trigger guard cutout where the trigger sets. These burrs were rubbing against the trigger creating a visible mark on the trigger. This rubbing causes friction which increases trigger pull. I removed all parts from the trigger guard and used a 320-grit flat polishing stick to gently polish off the burrs and smooth the surfaces. This prevents the trigger from rubbing. I performed the same polishing to the inside of the frame where the hammer rides to again eliminate some burrs. You can clearly see the scratch on the left side of the hammer caused by a burr on the frame. As mentioned before, the Wolff Redhawk spring pack came with 3 lighter mainsprings; 12#, 13#, and 14#. The factory mainspring is 17#. I was astonished at just how heavy the single-action trigger pull was with this gun. I placed the rear of the hammer strut in a padded vise, pushed down on the mainspring lever, removed the takedown pin, and gently relaxed pressure on the factory spring. I wore safety glasses and covered the assembly with a cloth so I wouldn’t lose the spring. I polished the hammer strut with 800-grit wet/dry sand paper, then replaced the mainspring with the 12# replacement mainspring, the lightest of the three. I reassembled the gun and tested the new spring with 6 empty .45 LC cases primed with CCI 300 large pistol primers. CCI primers are the hardest in the industry so if the gun can reliably ignite CCI primers, it will pretty much fire anything else. I loaded the cases into the cylinder and tested by cycling the gun double-action. The hammer does not come as far back in the double-action cycle as it does manually cocking it single-action. All 6 primers ignited, and the trigger returned without binding. The double-action was already smooth, but heavy. Replacing the factory mainspring with a lighter after-market spring significantly reduced the trigger pull. This gun now feels like a Smith & Wesson revolver. The whole purpose of this exercise was to see if I could modify the .45 LC Redhawk to take .45 ACP using full moon clips. In order to accommodate the moon clips I had to mill the ejector star. This was not a problem with my CNC mill, but I needed to do a little math first. According to SAAMI cartridge specifications the rim of a .45 LC case is 0.060” thick, but the rim of a .45 ACP case is only 0.049” thick. The thickness of my .45 ACP moon clips is 0.032” so it’s time to do a little math. The thickness of the ejector star was 0.070”. I was afraid I would have to mill 0.032” off of the ejector star which was almost half of the thickness. I was concerned that removing that much metal would weaken the ejector star, but removing only 0.021” should not affect the strength of the star. However, I won’t be able to use moon clips for .45 LC cartridges, but that’s really not a problem. If necessary, I could use speed loaders. I fixed the cylinder to the milling table of my hobby CNC mill and centered a 1/4” square end bit to the center of the cylinder. I milled 0.021” off of the ejector star. I left the ejector star installed on the cylinder; the cylinder provided extra support during the milling process. Now .45 LC cartridges can still be loaded one at a time as before, or by using a speed loader. The rim of the case sets on the outside edge of the cylinder and doesn’t touch the ejector star. Headspace is still on the rear face of the cylinder exactly the same as when the revolver came from the factory. With the recessed ejector star, I can now load six .45 ACP cartridges with a full moon clip. I did notice, however, that a raised primer had a tendency to bind the cylinder because the primer would rub against the recoil shield. If I plan to shoot .45 ACP with this revolver I need to make sure all primers are flush or below the level of the case head. This used revolver had been fired, but not cleaned very well, and apparently never been disassembled. I completely disassembled, cleaned, and lubricated it like I do to all my guns. Milling the ejector star to accept .45 ACP cartridges in moon clips makes this revolver much more flexible. I can’t wait to try it out. For future owners of this gun I will add a note to the manual indicating that this gun will now take .45 ACP cartridges if used with a full moon clip that is 0.032” thick. So it's not exactly a model 5032 because it doesn't have the removable front sight, but it will shoot .45 ACP with full moon clips. By the way, the ejector star is a restricted part that must be installed at the Ruger factory. If I had screwed it up I would have had to send the entire gun to Ruger and pay for shipping, the part, and labor. A special thanks to the great folks at Kittery Trading Post in Kittery, Maine. Their customer service has to be second to none; they helped to make this purchase and the transfer process quick, easy, and affordable. Check out their web site for great prices on used guns. © Copyright 2016 Roy Seifert.